Life as a father has been amazing. My kids make me laugh and love like I’ve never before. Although it wasn’t an easy ride for my wife and I in conceiving. Despite having my oldest son from a previous relationship, my wife and I struggled for a long time to have our own child together. Claire is an amazing step-mum and has been in my eldest’s life since he was born and has a great relationship with him, yet for her it just wasn’t the same. Many women are told as little girls that they will grow up to be mothers, and in Claire’s case that’s what she always wanted to be. It’s not the same for men – although my mum did hint a lot in my younger years. When I was 19 she told me to settle down and the fear that set in was only relieved by my uncle’s laughter as he reminded her times are different than they were when she was 19 when she was married and expecting me. Anyway, after a year married, Claire and I started to worry about our prospects of starting a family. We made the nervous trip to the doctor’s surgery and were then referred to the fertility clinic at the RAH in Paisley. I will always remember the first appointment at the fertility clinic for the music played over the P.A. system. As we sat anxiously in the waiting room with other couples and pregnant women, Ace of Base’s 1992 U.K. Number One “All That She Wants” played. It’s the song you may recognise by its chorus which repeats the line “All that she wants is another baby”. Ironic eh? Given my sense of humour, I did point this out to Claire and we laughed it off. It was wasn’t the staff or the hospital’s fault after all. We always hoped that we would conceive naturally during our wait, like many couples in our position do. However that was not the case. I had expected long before Claire and I were together that I may be infertile and it was a shock finding out after the breakdown of our relationship as a result of my indiscretions that my ex-girlfriend fell pregnant. There is nothing in life that can prepare any person for that phone call. So during our visits, and waits on progressing through the supposed two-year wait, I had to remind Claire that it was most likely my fault that we were in this position and reassure her that it wasn’t her. This didn’t wash often when we went to pick up my eldest that day, or the following day of an appointment. 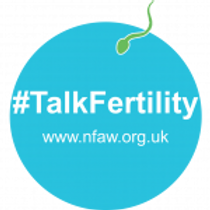 Every year the Fertility Network organise a National Fertility Awareness Week to encourage people to talk about fertility issues. It is estimated that as many as 1 in 6 couples will experience fertility problems at some point. So it is likely that people reading this will have experienced similarities to what they are reading or know someone who has. It happened to us on our wedding day and after the birth of our son. There is no malice on the side the questioner in asking, and it’s something that is usually laughed off. However when going through what we had, it makes you more nervous, upset and feeling like a failure. Claire started talking with the Fertility Network and they were a great help to her. She tried to start a support group for other couples in our area, but it didn’t last long. As for myself, I tried to stay quiet and very few people knew what we were going through. Only close family, friends and employers. Thanks to extra investment to bring down the waiting times of our health board, we were able to start the procedure a few months earlier in Edinburgh. When we were first asked if we would like to take an earlier opportunity to start the treatment, Claire was determined to take it. I was against because I was afraid. Afraid because I didn’t know what was going to happen, or what pressures travelling to Edinburgh on a regular basis would put on Claire or our relationship. We eventually agreed to the offer. There were many early mornings to beat the M8 traffic for our 8.30 or 9 o’clock appointments. I think the worst part of the journey was Claire’s choice of music. I can still sing along to every song from Disney’s Frozen and not because I watch the movie often with our kids. The best part of the drive was often our trips to Krispy Kreme in Edinburgh on the way back. After our tests, we sat in the room with the fantastic staff as they talked through what was happening from this point on. Having the procedure explained to us and being told to drive through every second morning was pretty daunting. Even more daunting was the expectation that I would help Claire with her injections each morning. Despite my tattoos, I still have a fear of needles. The results confirmed what I already knew. They also induced further sadness and fear as the nurses explained a term I’d never heard before – ICSI (intracytoplasmic sperm injection). This is a form of IVF that is common and used for males with a low sperm count and low mobility. We asked for more details such as side effects and we were told there was a higher risk of our child having Down’s Syndrome or neonatal abnormalities, such as hypospadias in baby boys. Our first cycle was successful in producing enough embryos to give us hope. The first transfer, what is known as the fresh cycle, was successful and we fell pregnant. Unfortunately we miscarried at 5/6 weeks. Going through IVF and knowing how long you’ve been pregnant, even this early on, was a strange feeling as many women don’t know they’re pregnant until after 5 or 6 weeks, some a lot later. We were extremely excited and equality terrified and to have your dream taken away was traumatic for us. We had only told a handful of people that we were expecting and to have to inform those just a few short weeks later was horrible. It was soul destroying. I never really spoke about it until I broke down one day, just before we were told we could start the frozen embryos. In May 2014 we headed back to Edinburgh for another embryo transfer and on 20th February 2015 he was born. Going through everything we have made us stronger and I encourage anyone reading this who has faced or is facing a similar journey to be strong, support your partner and talk about how your feeling. By being open about such issues can we change the perceptions of fertility issues. National Fertility Awareness Week 2017 takes place Monday 30th October to Sunday 5th November. See more at www.nfaw.org.uk.